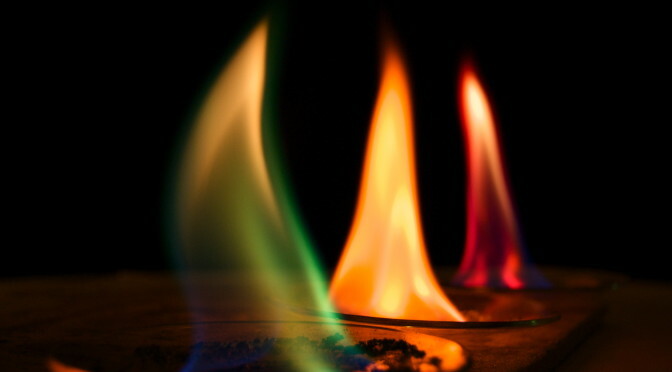 Here in the UK, I think we’d more commonly refer to the demo as “Flame colours”, and at the head of this post is a photo I took of it a few years ago. As best I can tell, the cause of the accidents in the US has been demonstrators topping up the flame straight from the methanol bottle, leading to the ignition of a large volume of fuel vapour. Now, I’d hope most people reading this blog will be wincing right now. It was drilled into us (in school) that you never open a bottle of fuel near a naked flame, and that the correct procedure here is to ensure the watch glasses are cold before adding a small amount of fuel (typically with a pipette), then sealing the fuel bottle and removing it to a safe distance, before lighting the mixture in the watch glasses. That would be standard lab practice, and it’s near-inconceivable that a teacher would pour meths from a bottle directly onto a flame. However, one thing we learned from SciCast is that we’re into the second generation of science teachers who’ve never really ‘done’ practical science. 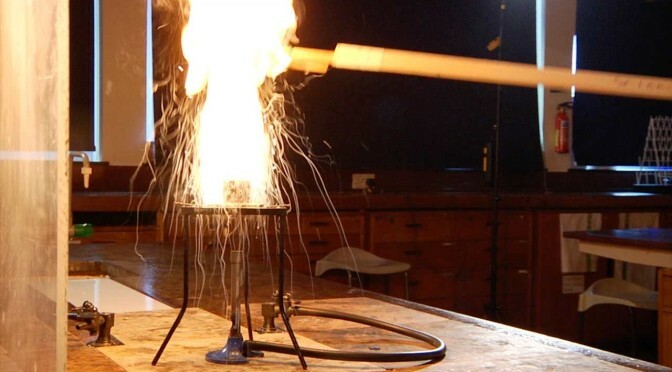 Recent science graduates don’t necessarily know how to handle flammable materials; they may never have been taught. That generational knowledge gap was one impetus behind the demonstration films Alom and I have been making for the National STEM Centre and others, and also for this website. So pass this on, please, and let’s not make assumptions. Oh, and if you’re a teacher in the UK, the version of this demo you should do is probably the one with ethanol spray bottles. That’s the version the Royal Society of Chemistry and Nuffield promote, but – as ever – check with CLEAPSS for their standing advice.